I have been on a vocabulary roll lately. Everywhere I go, I find myself intrigued by vocabulary instruction possibilities inherent in our everyday experiences, enmeshed as they are in technology and media. Idea #1: Driving home listening to an NPR radio show on new words from 2010, I found myself singing “I’m a belieber” to the tune of the Beatles song. No, that is not a typo — a belieber is someone who is a fan of Justin Bieber! It would be fun and productive to have students nominate, advertise, and vote on “new” words or phrases, drawing on popular culture and current events, as well as local words that are part of their school, family, or community scene. My sisters and I know to back off and give the “donkey” some space, or to gently offer help (for memorable Shrek quotes, see http://www.imdb.com/title/tt0126029/quotes ). Students could post their written or multimodal nominations for new words to a class or school-wide vocabulary blog and construct a voting poll using a free tool like Survey Monkey (SurveyMonkey.com). 1 minute podcasts for the ‘New word of the Week’ could become a regular feature of your class! Idea #2. While we often bemoan the low level of vocabulary heard on TV, inspiration can be found in unlikely places. “The Big Bang Theory”, a sitcom about a group of nerdy academics, makes me laugh out loud at the way language is used. The show presents multiple opportunities to engage students in exploring advanced vocabulary in a humorous social context. Students could watch video excerpts (there are a slew of them on youtube.com ) or read quotes (again, just Google ‘Big Bang Theory’ and you will find lists). They would work with words in different ways, depending on the quote. 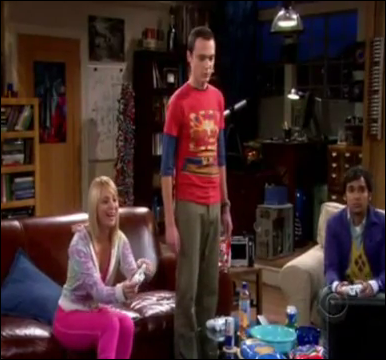 Sheldon: This is a complex battle simulation with a steep learning curve. There are a myriad of weapons, vehicles, and strategies to master, and not to mention an extremely intricate back story. Penny: Oh, cool! Whose head did I just blow off? The youtube scene is 2.49 minutes and includes several great examples of vocabulary and figurative language; http://www.youtube.com/watch?v=fd37YLDWv28. Students could begin by delving into Sheldon’s vocabulary (e.g., complex, myriad, intricate, back story, steep learning curve) and then discuss why Penny’s response and the outcome are both ironic and funny. Would it be so humorous if Sheldon had merely said “Halo is an awesome video game that I play all the time”? What if Penny had failed at the game? To extend the activity, have students create their own conversational exchanges contrasting “expert” and “novice” ways of talking so as to poke fun at the expert (or perhaps the reverse). Sheldon often has difficulty understanding the social nuances of language. Here’s another quote from the show that invites a discussion of the differences between literal and abstract meanings, and the fun that can be had when we intentionally (or unintentionally) confuse the two. And, finally, here is an example of Sheldon’s use of hyperbole (i.e., exaggerated language that is “used to evoke strong feelings or to create a strong impression, but is not meant to be taken literally, Wikipedia). Sheldon: When I try to deceive, I, myself, have more nervous tics than a Lyme Disease research facility. In addition to interpreting and critiquing “Big Bang Theory” language use, students could be challenged to find examples in current events, TV, songs, billboards, and overheard conversations. Another way to approach hyperbole is to start with an image as a stimulus. 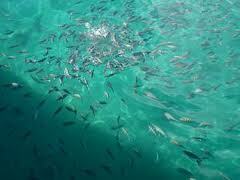 Consider this photo of a fish feeding frenzy. Figuratively speaking, when do people go after something (other than food) with a voracious appetite – mobbing a celebrity for an autograph? devouring books? All too often, students think learning vocabulary is boring (especially when it involves looking up definitions and writing sentences). Media and technology offer a fruitful playground for vocabulary learning, appreciation, and expression. Try it and see! And, please post a comment to share your insights and experience. I can say without hyperbole that I would be over the moon! NOTE. Photo acknowledgement: Creative Commons license. fish feeding frenzy by devan.laney. 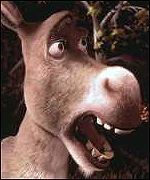 Shrek movie image of donkey retreived from Google Image. Image from Big Bang Theory taken from youtube.